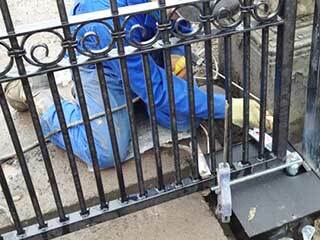 One of the most obvious, yet often neglected, ways of keeping your home or business safe is to have a strong gate installed. Not only does this provide added security and (when combined with an electric opener and an intercom system) convenient accessibility and communication with visitors, it can also contribute to your property's curb appeal. But which one do I choose? You may ask. Well, here is a short overview of the most common options. What you choose to have your new gate made of makes a huge difference, as it can either make it very suitable to your home and your local climate, or a major hassle that requires a lot of maintenance. Wrought iron gates are known for the beauty and prestige their ornate designs can bring, but they need to be inspected for rust and repainted annually to preserve their condition. Wood also needs repainting, as it can rot or warp in very moist conditions. But its classic cozy charm is hard to beat. In terms of privacy and security, nothing tops a powerful steel gate. Of course, this type of system tends to be heavier and will need a powerful opener to move. While there are certainly more than just three kinds of automatic gates, the following three are by far the most common options. A swing gate works like a regular door, moving on an axis of hinges. It needs enough room to open outwards or inwards, and if that's something your driveway is lacking, you can consider a sliding gate, that moves laterally to the side. They each can be made of the same materials, but some consider the one or the other to hold a bit more class. It's just a matter of preference really. Of course, if maneuverable space is really an issue, you can simply get a barrier gate, otherwise known as a lifting-type system. It's more commonly found in parking garages and entrances to large businesses, as it is usually used more for traffic control than for privacy purposes. If you're installing a new automatic gate, you definitely need to make sure you find the right opener for your needs. This is the device that allows the automation to occur, but there are all sorts of added features that this type of unit can come with. Smartphone connectivity and solar panels or a backup battery are very famous for the added convenience and functionality they bring to the table. There's also the intercom system. You can have a wired or a wireless unit, and even one that dials straight to your mobile phone whenever someone buzzes. Our team here at Gate Repair Long Beach would happily provide all the information you need and answer any questions you may have. Our custom made systems are famous for their reliability and durability. Give us a call today and our experts will help you choose the gate of your dreams.